The A100 is ATK’s small bus offering within the product line for microsats and nanosats. Once upon a time, every satellite was a small satellite. At the dawn of the Space Age, the limitations of the rockets then available put a severe constraint on the mass of satellites: Sputnik 1 weighed in at 83 kilograms and Explorer 1, America's first satellite, was just 14 kilograms. As rockets became more powerful, though, satellites got bigger, as the government and commercial users of those satellites sought to increase their capabilities. Today, for example, a commercial communications satellite can weight over six tons. Bigger, though, is not always better. A larger satellite can, for example, carry better cameras for observing the Earth or more powerful transmitters for relaying communications to users on the ground. However, that larger satellite can be more complex to develop, cost more, and take longer to build, with no guarantee that it will work as intended once in space. A modern-day communications satellite can take three years to build at cost of up to several hundred million dollars, limiting its customer base to a handful of large companies and government agencies. In the last decade, and especially in just the last few years, the pendulum has started to swing back to smaller satellites, at least for some applications. Advances in electronics and the miniaturization of other spacecraft components now make it possible for smaller satellites--weighing from a few hundred kilograms down to as little as a few kilograms--to perform missions that previously required much heavier spacecraft. While there are many applications that will still require large spacecraft, smallsats are carving out a growing share of the market among users in universities, governments, and industry. Smallsats have been around, in one form or another, since the Space Age began. However, the modern interest in smallsats can be traced to two separate, but parallel, development efforts. The first started at the University of Surrey in the UK, where a group of engineers led by Martin Sweeting started to experiment in the mid-1970s with the use of inexpensive off-the-shelf components to build satellites. Their first spacecraft, the 72-kilogam UoSAT-1 was launched in 1981 and worked better than expected. In 1985, the university spun out Sweeting's smallsat effort into a company, Surrey Satellite Technology Ltd., or SSTL. The company has since developed a series of increasingly sophisticated smallsats, evolving from simple technology experiments like UoSAT-1 to Earth observation missions for governments around the world, as well as the initial demonstration satellite for Europe's Galileo satellite navigation system. In 2008, EADS Astrium purchased SSTL from the University of Surrey, but SSTL continues to operate as an independent entity. SSTL has found a niche developing Earth observation satellites weighing between 100 and 300 kilograms (a class of smallsats frequently called "microsatellites"), including a series of spacecraft for various governments that are part of the Disaster Monitoring Constellation (DMC). The satellites in the DMC provide medium-resolution images useful for responding to and recovering from various natural disasters. Having several satellites working together also allows for more frequent imaging of the same location. 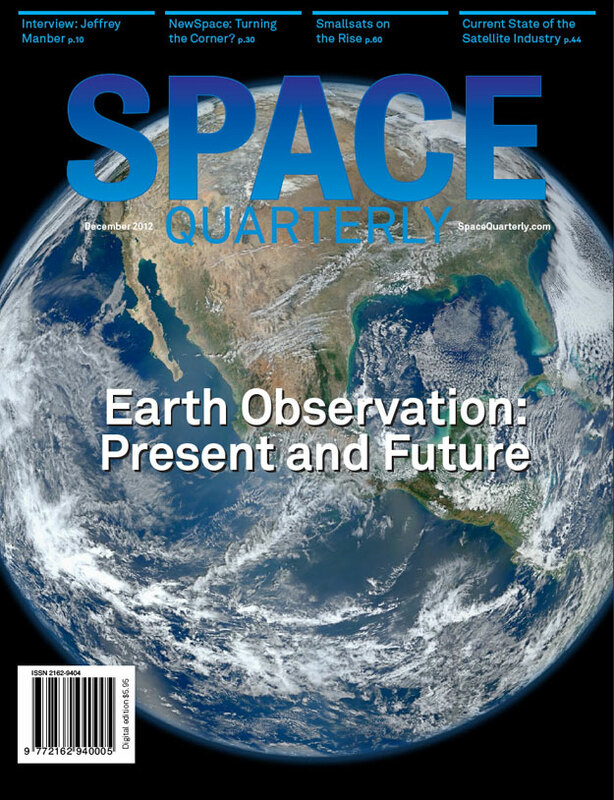 "One area that has really taken off is the application of small satellites to Earth observation," said Sweeting during a panel session on smallsats at the AIAA Space 2012 conference in Pasadena, California, in September. The low cost of individual smallsats, he said, enables the development of constellations of satellites like the DMC. "We can add an additional dimension: it's not just spatial resolution, it's the addition of temporal resolution that really makes the difference." While SSTL has built a reputation as a developer of microsatellites, others have sought to go ever smaller. In the late 1990s, Jordi Puig-Suari, a professor at California Polytechnic State University, and Bob Twiggs, then a professor at Stanford University, worked to design a spacecraft platform simple and inexpensive enough that universities could build them as student projects. They settled on a cube ten centimeters on a side, with a mass of about one kilogram--the CubeSat. One of five RapidEye spacecraft undergoing tests. The RapidEye uses the SSTL-150 platform with up to a 50kg payload mass. Credit: SSTL. While initially intended primarily as student projects, CubeSats in recent years have served other roles as well, from space science research to technology demonstrations. Part of that evolution has come from the use of CubeSats as a standardized building block for somewhat larger--but still very small--satellites. One common approach is the "3U" CubeSat, where three CubeSats are attached to create a spacecraft 30 centimeter long, big enough to make room for larger batteries, solar panels, and other components that increase its utility. CubeSats are also making a contribution in education, giving students hands-on experience on space hardware that's not possible with larger spacecraft. "We are generating the next space generation," said James Cutler, an assistant professor at the University of Michigan who runs a smallsat lab. "We are generating students who are excited, who are clever, who have amazing ideas that can transform the space world." Just what is possible with a 100-kilogram, or even a 10- or 1-kilogram, satellite? There's no shortage of ideas for smallsat missions, many of which are starting to take shape in the labs of universities, space agencies, and companies. Earth observation remains a major field of interest, thanks to the potential to field constellations of satellites to provide the temporal resolution - rapid revisit times - cited by Sweeting. SSTL is working on the latest generation of DMC satellites, called DMC3. The constellation of initially three satellites, planned for launch starting in 2014, will provide imagery at a resolution of one meter per pixel, not much worse than the best commercially available images from much larger satellites. DMC3's innovations go beyond technology. "It's not just the technical advances that we need to develop, but the business models as well," Sweeting said. The DMC3 satellites will be leased to various users, in much the same way capacity on commercial communications satellites is handed, he said. A Chinese company, 21st Century Aerospace Technology, has already signed a seven-year contract to lease the first three DMC3 satellites. In the U.S., a startup company called Skybox Imaging, also plans to develop a constellation of smallsats for imagery. Its first satellite, SkySat-1, is planned for launch in the coming months on a Dnepr rocket. Ultimately the company plans to build and operate its own constellation of such spacecraft, selling a variety of data products for various industries created by adding satellite imagery with other information. Skybox is also one of the few emerging space companies to raise money from venture capitalists: it received $70 million in April from several VCs to help fund its satellite development plans. Smallsats, including CubeSats, are finding roles in science missions as well. "We're on the verge of doing some really neat science with CubeSats," said Ben Malphrus of Morehead State University in Kentucky about the Cosmic X-ray Background Nanosat (CXBN), a 2U CubeSat launched in September as a secondary payload on an Atlas V. That satellite is designed to study the cosmic x-ray background in a range of energies not measured well by previous spacecraft missions. The data from CXBN, Malphrus said, may help scientists choose from competing models for the origin of those x-rays. 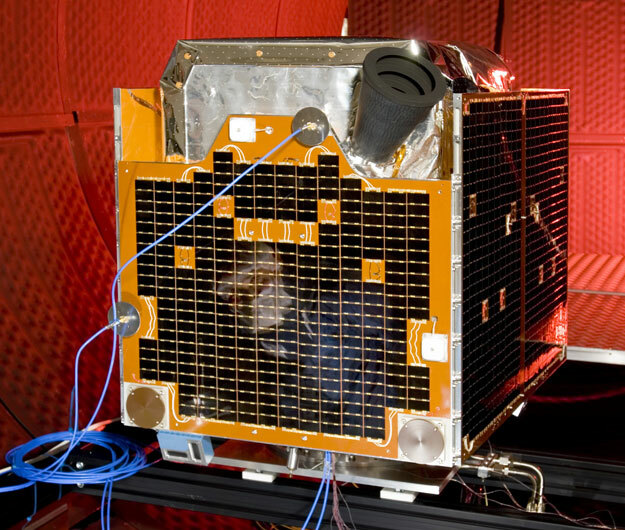 Another example is the University of Michigan's Radio Aurora Explorer 2 (RAX-2) satellite, a 3U CubeSat launched in October 2011 to study plasma irregularities in the ionosphere. "It has made fundamentally new measurements. No one has ever made these measurements ever," said Cutler, who led development of RAX. 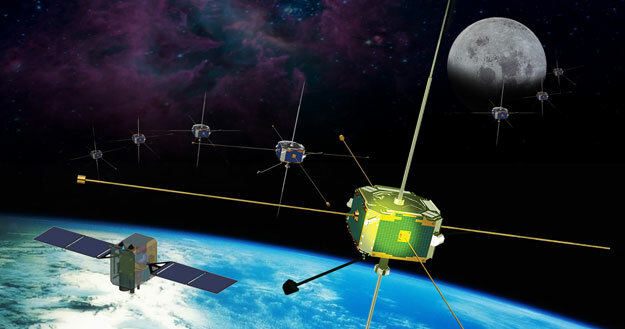 A National Science Foundation program specifically designed to support development of CubeSats for space weather and related research funded the satellite. NASA's Office of the Chief Technologist (OCT) also sees the potential of smallsats to demonstrate new technologies in space as much lower costs--and lower risks--than on larger spacecraft. In August, OCT selected three smallsat missions proposed by industry to test novel technologies. One satellite will see if its solar array can also be used as an antenna, allowing for faster data rates. Two other missions will test sensors and docking technologies. A separate NASA smallsat mission concept, the Edison Demonstration of Smallsat Networks (EDSN), will fly ten CubeSats to test how a swarm of such smallsats could work together. 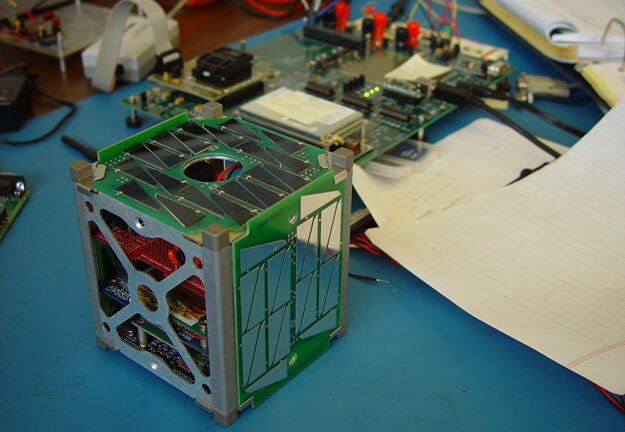 DARPA DMACE Challenge prototype CubeSat. Credit: DARPA. The biggest obstacle to the greater use of smallsats may not be the technology of the satellites themselves, or the potential uses of them, but instead the challenge of getting them into space. Most rockets in use today are designed for much larger satellites and are far too expensive for the universities and smaller companies that are at the forefront of smallsat development. This has led smallsat developers to look for alternatives, from hitching rides on those larger rockets to flying groups of smallsats on converted Russian ballistic missiles like the Dnepr and Rockot. Several years ago, the smallsat community thought they had a solution to the launch problem in the form of SpaceX, whose Falcon 1 could launch satellites weighing up to several hundred kilograms for as little as $6 million (a price that later rose to a little more than $10 million.) After failures on the first three launches, Falcon 1 made successful launches in 2008 and 2009, only to be effectively retired by SpaceX, citing insufficient interest from potential customers. "There's a cloud on the horizon," Sweeting said of launch challenges. Prices for launches on existing rockets, including small Russian launchers, have been going up "dramatically" in recent years, reducing the opportunities for smallsats. "SpaceX was once our great hope, but is now focusing, understandably, on the more lucrative and larger end of the business." There are some other solutions emerging. NASA and the Defense Department are offering an increasing number of opportunities to fly smallsats as secondary payloads on their missions. NASA's Educational Launch of Nanosatellites (ELaNa) program, for example, is specifically designed to give free rides for university-built CubeSats, flying them as secondary payloads on government launches. "The community knows that if I build my CubeSat, if I get the money to go build it, there are going to be rides there for me," said Garrett Skrobot, who runs the ELaNa program. The risk of flying as a secondary payload, though, is that such satellites are at the mercy of the schedules and mission requirements of the larger, primary payload. That was demonstrated in the October launch of a Dragon cargo spacecraft on a SpaceX Falcon 9. The rocket also carried a small technology demonstration satellite for commercial communications satellite company ORBCOMM as a secondary payload. When one of the Falcon 9's first stage engines failed, the second stage had to burn longer to put the Dragon into the proper orbit. That meant there was not sufficient propellant according to the mission rules for the primary, NASA mission to reignite the second stage to put the ORBCOMM satellite into its planned orbit. The satellite reentered just a few days after launch. To overcome the problems associated with secondary payloads, there is renewed interest in dedicated smallsat launchers. In July, Virgin Galactic announced plans to develop LauncherOne, a rocket designed for launching satellites weighing up to 225 kilograms. The two-stage rocket will be air launched by WhiteKnightTwo, the aircraft Virgin developed for its SpaceShipTwo suborbital crewed spacecraft. The cost per launch will be "under $10 million," according to Virgin, without being more specific. "Going into the small launch business was a logical extension" for Virgin Galactic, said executive vice president Steve Isakowitz. "We do believe that it's an area that is well underserved, and a great opportunity for Virgin Galactic." The company plans to begin LauncherOne missions in 2016, and has already signed up a number of anchor customers, including Skybox Imaging and Planetary Resources, the company unveiled earlier this year that plans to do commercial asteroid prospecting. If Virgin Galactic, or possibly other companies, can provide systems that lower the cost of smallsat launch without having to fly as secondary payloads, they could further enable a smallsat industry that has already found success in a growing number of applications. Mason Peck, who worked on smallsat projects as a professor at Cornell University before becoming NASA's chief technologist in January, is confident about the role smallsats play in the broader space industry. "Small satellites are not the wave of the future," he told the AIAA conference audience in September. "They're the present."